Anyone paying attention knows that Jeep’s 2007 Wrangler (JK) is about the hottest thing to hit the four-wheeling market this year. Being all-new means that every aftermarket company in existence is scrambling to come out with goodies for it. While some of those companies will be late arrivals, others will be early on the scene. Of those early birds, some will have advantages over others. One of those with an advantage is Superlift. Our pals down South have some pretty good ties with the folks at DaimlerChrysler, as well as AEV. Those relationships allowed the Superlift gang some early access to the new JK. 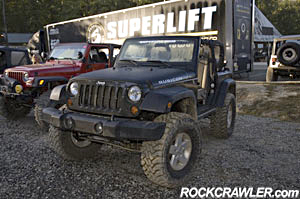 In fact, some of the testing was even done at Superlift’s ORV Park in Hot Springs, Arkansas. So it stands to reason that Superlift’s inside track would mean they’d have one of the first suspension kits for the JK to hit the market – and they wanted to show it to us. OK, well, not just show it to us. They flew us out to Hot Springs to grab the wheel of a pre-production JK and pound the snot out of it on the rocks! It’s good to have friends. Superlift is offering three kits for the JK. The first is a 2″ spacer kit (part # 5702) that will clear a 33″ tire. This was not yet available for our visit. The other two are essentially the same but differ by an inch. Under the Superlift brand will be a 4″ kit, while their Black Diamond brand will get the same kit but with 3″ springs. We were in Hot Springs to drive the 4″ Superlift kit so that’s what we’ll talk about here and show you photos of. The 4″ kit will be available under two part numbers. K920 will fit 2 door JK’s while K921 will fit 4 door JK’s. The kits include springs all around, Urethane bump stops to handle compression, shocks, an adjustable front track bar, rear track bar bracket, alignment cams, rear extended swaybar links and assorted hardware bits. Optional parts include swaybar disconnects for X and Sahara models without the automatic swaybar disconnect, steering stabilizer, extended brake lines and adjustable control arms. The kit we saw was already installed on a 2 door Rubicon model. If you’ve followed the JK into production, you’ve probably seen articles showing the JK’s in Africa. This particular Jeep belongs to Jeep’s Skunkwerks team and was one of those mules abused in Africa. Now it has come home to live with Superlift for a while. Looking carefully at the parts list, you’ll notice that unlike TJ kits, the JK kits do not include any control arms. Why? Because from the factory, the JK comes with mid-length lower control arms. They are a good bit longer than TJ arms, though not technically “long arms.” Because of this, you can stick a 4″ spring in without greatly effecting caster. The JK does not have alignment cams from the factory, so the kit includes them so you can make minor caster adjustments to dial in the alignment once installed. If you feel like you want a little more flex and more adjustability you can order up the optional Rockrunner control arms. Our tester Jeep did not have the Rockrunner arms. In fact, it didn’t even have the alignment cams, as they were not ready yet. The JK on-site was sitting on 37″ x 13.50″ x 17″ Toyo Open Country M/T tires. Superlift’s official materials say that you can fit a 35″ x 12.50″ tire underneath with notes saying that you can fit a 37″ with some modifications. This Jeep had been modified. The front bumper had been spaced forward about an inch and the rear edge of the rocker had been trimmed – both in order to clear the tires. The wheels, having deep stock backspacing had Spidertrax wheel spacers (part # WHS-010) to push the wheels out a bit. These modifications were very unobtrusive and we might not even had noticed them if they didn’t bring them to our attention. The bumper spacers may become a production optional part. Chances are, though, that you would not need these with an aftermarket bumper installed. One other thing of note is the driveshaft angles. While the Jeep was on the lift it was apparent that the JK’s fixed yoke shafts were about at their operational limits. The style of C/V joint used is not made to take the abuse of more severe angles found on lifted Jeeps when used off-road. Why Jeep used them, nobody seems to know. While we didn’t notice any binding or problems during our trail testing, time will tell whether they will hold up long-term. Tom Wood and JE Reel are already working on JK conversion kits to use traditional C/V joints. Understand that this angle issue is inherent to the JK and is a problem that every suspension manufacturer will have – not just Superlift. Before hitting the trails we took the JK for a ride on the streets near the park and on the highways surrounding Hot Springs. The suspension felt good, and was predictable at all speeds. Even without the alignment cams, the Jeep’s handling was acceptable for the most part, and certainly better than many lifted TJ’s we’ve driven. Adjusting the caster could only improve it that much more. Ride quality was good and much less jarring than lifted TJ’s. The JK has a much softer-feeling setup from the factory to begin with. Jeep uses 22 different spring part numbers at the factory so Superlift has had to come up with a best-choice for their kit. At the rear, there are different springs for two and four door models to handle the weight difference. One thing that is becoming a headache with lifting all new vehicles is the advent of traction control. The JK has a pretty stout set of controls onboard, including hydraulic brake assist and electronic roll mitigation. In our test drives of stock JK’s we found it a bit obtrusive. Throw larger tires on and some lift and the computers get all confused. We needed to disable the switch on the dash in order to drive the lifted Jeep properly. Superlift is working hard on a black box to interface and update the system to work with the lift kit. During sharp turns the Jeep did not exhibit any scary body roll and didn’t surprise as at all. At highway speeds up to around 80 mph, it tracked straight and also didn’t throw any punches. We spent the whole afternoon on our first day in the JK and the better part of the second day, as well. Pete Trasborg from JP Magazine and I swapped out time in the driver seat while the other took photos. I knew on the second day that Pete was an ok guy when I saw him yanking the top and doors out of the Jeep first thing in the morning (it was in the low 40’s). A JK on 37″ tires looks massive. Already larger than any previous Wrangler, the JK’s just look awesome lifted. Their extra length and width tend to make them more stable on the trails, as well – especially on side hills. This JK did awesome all weekend. Though the factory auto swaybar disconnect almost felt like cheating, it was great have. Disconnecting it allowed the front end to flex out and be more compliant as we tromped over the rocks and ledges. On the side hills and long, steep ascents, reconnecting it lets you feel that much more comfortable on-the-fly. The suspension worked very well and the ride was comfortable (really). Our kidneys all stayed in place and we experienced no bleeding. Time, settling and abuse will soften up the springs a bit and that will be a good thing, as well, allowing a little more flex on the rocks. What’s really cool about this kit is that it’s really pretty inexpensive as far as lift kits go. Hitting the street around 600 bucks means more money to spend on tires and other goodies on the Jeep. If you want more flex and more adjustability, add the Rockrunner arms. For the most part, though, the out-of-the-box setup should work just fine and come in at half the cost of most TJ kits. We hope to get a Superlift kit here on a project Jeep soon so we can get more seat time and a true long-term feeling about the kit. Judging, though, by our initial drives and our experience with Superlift in the past, we’re confident that this kit has a great future. The future is pretty much here, too, as these kits should be hitting the shelves right about the time you read this. OK, so that’s not really the whole story from the trip. No ‘wheeling trip would be complete without some problems. We did have some that we may as well report here. Please note that they had absolutely nothing to do with Superlift! While parked at camp, Trent McGee from Superlift was one of the first to discover that Jeep in their infinite wisdom has not fixed one of the biggest issues four-wheelers have faced with the TJ Rubicons. That’s right, the front axle joints still use half circle clips. What’s that mean? It means that under real off-road conditions they tend to walk and once they walk far enough, the joints come loose and next thing you know you’ve got a busted axle shaft. Trent noticed our mule’s clips a-walkin’ and we had our good friend, Mark Hinkley tack weld them back into place so we could go have more fun on the rocks. Thanks Mark! Of course, it wasn’t too long before Mark was put to work helping me out again. Alright, now he who hath not aired down too far and peeled a tire off the bead may cast the first stone. Yup, off the tire went with the Jeep aiming downhill. Oh boy, what fun. Thanks to everyone who jumped in to reseat the tire – especially Russ Baer from Baertrax who laid underneath the Jeep and took a nap. Actually, he was helping by putting pressure on the back side of the tire with his feet.